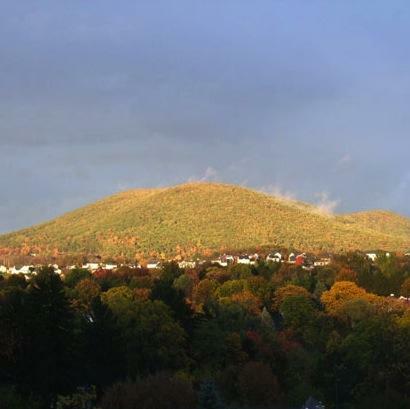 An image of Mount Nittany shot in October by John Hook and posted at http://www.mtnittany.org. No one keeps an exact count of people climbing Mount Nittany. There are no tickets for access, no turnstiles at the popular trail head in Lemont. But as best the nonprofit Mount Nittany Conservancy can tell, foot traffic on the mountain seems to have grown substantially in 2010, group officers said this week. Conservancy board President John Hook speculated very generally that perhaps as many as 100,000 people climbed Mount Nittany in 2010. That very rough projection is based on the number of conservancy brochures that hikers picked up at the trail head in Lemont. If the projection is accurate, it would represent a dramatic spike over recent years. Through 2009, Hook said, conservancy leaders had estimated that perhaps 25,000 to 30,000 people scaled the mountain annually. Those earlier estimates had been based on the brochure pick-up rates, as well. "I can't say that I've ever seen quite as many cars lined up" at the Lemont trail head, said Bob Andronici, the conservancy board vice president. And while "we have no way of counting" traffic precisely, he said, "I've sensed that there is a lot more." Consider this: In the past nine months, according to Hook, people have picked up nearly 30,000 conservancy brochures from the Lemont trail head. That's about the same number that were picked up in the entire five years combined, Hook said. Conservancy organizers also have discovered a substantial increase in erosion at the Mike Lynch Overlook, a popular mountaintop spot from which hikers can see the University Park campus. Erosion has worsened, too, in other trail areas, organizers said. Don't get them wrong, they said: They're thrilled that so many more people appear to be enjoying the mountain, and they want the foot-traffic trends to continue. To help address the erosion at the Lynch Overlook, they're putting together tentative plans for a protective structure of some type there. They'd like to have it in place in 2011. "Trying to find the right balance to guard against erosion and maintain natural beauty is a tough thing," said Blake Gall, the conservancy treasurer. He said the group is looking to engage some experts in the field as it develops a strategy. The conservancy, whose primary purpose is to protect and preserve the mountain in perpetuity, is seeking a grant from the American Hiking Society for the overlook preservation project. Costs may run in the $10,000 range, organizers estimated. In the spring, the conservancy put up more than a dozen new, very noticeable signs on the mountain trails. Most of those mark a trail intersection or an overlook, guiding hikers with GPS coordinates and other details. Other new signs -- about five of them -- help hikers stay on the designated trails, preventing them from getting lost. A number of labor volunteers -- including Penn State students -- helped the conservancy with the $4,000 project, financed by a Centre County Community Foundation grant. Those improvements may be a key in promoting foot traffic, conservancy organizers said. A year or two ago, the conservancy worked with the Pennsylvania Conservation Corps to clear out the Lynch Overlook -- and a couple other overlooks -- a bit more. That made the views from the top more expansive -- and, in turn, may be helping to lure more hikers up the mountain. Over the past four or five years, a lot more Penn State students have become involved in volunteer work on the mountain, helping to maintain and improve the trails. The engagement of student volunteers may have had a domino effect, drawing more of their peers to hike the mountain, too. "People are thanking us for taking care of the trails," said Andronici. " ... I think they get a sense that it's being managed, whereas maybe before they didn't." The conservancy, formed in 1981, has seen fundraising revenue climb, as well. To drum up money for preservation, it sells deeds to square-inch plots of the mountain. In the past six months, the group has sold as many deeds as it did in each of the past three or four years, Hook said. Proceeds are likely to support the eventual acquisition and protection of more Mount Nittany land -- and adjacent acreage -- by the conservancy. Already, the conservancy oversees and safeguards a total of about 825 acres, some in conjunction with the Lion's Paw Alumni Association. The conservancy's longterm goal is to protect all land between the 1,300-foot elevation and the mountain's 2,200 crest "as seen from the (University Park) campus and the Mount Nittany Expressway." It also would like to acquire land on the Boalsburg side, according to the group website. Another conservancy project tentatively in the works, Gall said, is the creation of Mount Nittany "viewing stations" at strategic points in the Nittany Valley. Those stations would be located where people have especially good views of the mountain -- such as at the Bryce Jordan Center, Mount Nittany Middle School and the university's arboretum. The conservancy could use the stations to distribute educational materials, he said. "We're happy to see more enthusiasm in the community," Gall said. 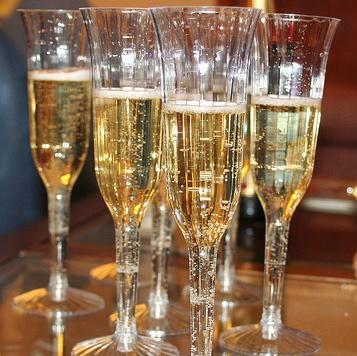 We can blow our horns and clink our glasses, but nothing will change at midnight tonight. It’s cold today; it will be cold tomorrow. The turn of the year is just another arbitrary date in a system of arbitrary dates.